I learned to play the ukulele a long time ago and put it out of my mind until last year, when I bought one for $99 just for the heck of it. I remember learning from the Beatles DVD set, that they took ukes with them while on the road: portable, and great sketch pads for writing songs. “Something” was a uke song. Our friend Rover stayed with us for a couple of weeks, and he practiced the uke daily. This got me playing mine again. I ended up showing him some useful techniques (always the teacher) and he ended up getting me hooked on playing the ukulele again. Our new pal, Rob, has picked up the uke and become quite good in a short amount of time. He used to play an instrument (like many of YOU have) and has found it a nice way to get back into music, doing harmony and melody, and it never takes itself TOO seriously. “Why so serious?” sez the Joker. But the frets on my inexpensive instrument were not aligned well and all the chords were out of tune––which drove me crazy. 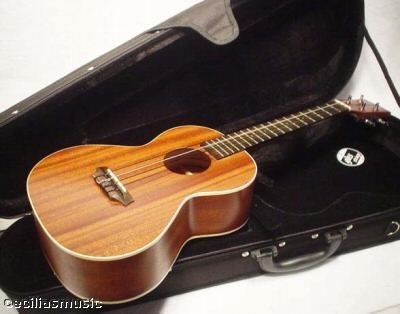 So I bought a new one and a better one––a tenor–there are five kinds of ukuleles that I know of: soprano, concert, tenor, baritone and the new fretless bass ukulele. To try to make four strings do what you want harmonically is quite a challenge, but I’m getting the hang of it. Its tuning is the top four strings of the guitar: G D B E. The soprano and concert have the G string tuned HIGH (“My dog has fleas”); the others, low, like the guitar. Last night Daniel played a playlist assembled by his Android colleagues of their favorite music. And I played along with it on my uke. What fun. Go buy a ukulele! You can get them for as little as $29. When you get better, buy a better one and give your old one away. Learn with friends. It’s a marvelous and rewarding hobby. And a funny thing is that everyone who plays ukuleles seems to smile while they play. I discovered your blog while searching for articles on George Crumb (I was talking to one of his pupils at a concert yesterday). The ukulele certainly is having a renaissance, there is a shop in London dedicated to ukuleles. A friend, who used to be a double-bass player, and who I had lost touch with, sent me an email recently, saying he was now playing ukulele and wrote a regular column for an acoustic music magazine. As I had never composed for ukulele before I wrote a two movement classical piece for him (fully notated). Apparently new classical music for ukulele is quite rare. Another friend of mine, a session guitarist, is often asked to play ukulele on sessions. He said not only are film composers using the instrument but sometimes there are two ukulele players on the sessions. Just to clarify a point though, I believe the tenor is usually tuned to the same re-entrant tuning as the soprano and concert. It is the baritone that is tuned like the top four strings of the guitar. However there are alternative tunings for the soprano, concert and tenor ukuleles. I am glad I have found your website after all these years of being conected to the internet. Nice to hear from you Ian. Actually tenor ukes can have either the higher or the low g string. Baritone only have the low G’s. I just played an electric bass uke in Hanalei, what a hoot! Not clear what the tuning is supposed to be on that. Next post: Where is the pause button?